Our theme this issue is truly one close to my heart. I loooove being grateful. I just love it. I write my 'grateful fors' daily, I say them out loud. I believe 100% wholeheartedly that what we put out attracts more of the same energy and being grateful for all I am, all I have, all that is - is important to me. So having the theme "Grateful" as our issue right now pleases me greatly. Not only does it please me to read all the amazing articles and columns in this issue, but the cover art is magical! Just wait till you see it. So grab a cup of something yummy and join us. 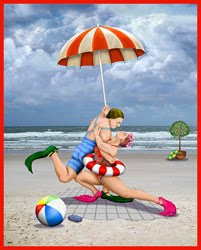 Copyright (c) Orna Ben-Shoshan "Tango on the Beach"